The show is based in one of those lettings agencies that are ten-a-penny, which you can pass a million times without knowing what sort of a business it is. It’s got a stupid name and it’s a stupid business. The show is about London Greek-ness and the way that looks and feels. And it’s about family, nepotism and the results of love. Stath is, for want of a Better word, an idiot. He’s someone who wants to be clever without learning. Stath is someone who assumed he must be amazing because it would be incredibly inconvenient if he wasn’t. I think a flawed character, specifically with British comedy, is at the heart of every good show. I think that probably makes sense across the world but in the UK, their flaw tends to be they’re too bad, and in America they’re too good. I think that it’s comforting to watch someone who’s less intelligent than you are. When you pitch a character like Stath, there aren’t many people in the world who are less good than him, so anyone can look down on him, which is useful. But it also allows you to empathise with them a bit more as well, which I think is a big part of comedy. Are there elements of you in Stath? I’d like to say no, but probably, definitely, yes! If I was to remove all airs and graces and if I was to never monitor myself and I’d never had any sort of training in this world, I would probably be Stath. He’s just a man who’s never listened to anything anyone’s ever said. He’s basically me if I had never listened to anyone and if I liked Euro R&B a bit more. Did you base aspects of him on anyone specific? He’s an amalgamation of various quirks I’ve seen in people over the years. I think that London is such a cultural hub that you hear all these different voices. Something that’s so colourful about London is how language morphs. He’s an amalgamation of all the odd uses of the English language I’ve ever heard but into one person. He’s probably more specifically an amalgamation of about seven people I’ve met in my life. But it’s an ode to them as opposed to slagging them off. I don’t think I would if I met him, but I think the joy of it hopefully is you can sit from afar and take what you want. I don’t think he has a choice but to be the way he is. He was born with that head and he has to live with it so you can’t really judge him. Which came first: the character or the show? I’ve been doing that voice for as long as I can remember. We tried to find a home for him. We felt like the world of lettings is a great base for comedy characters because it’s about people handing themselves the rope to hang themselves with. A potential renter will see a flat whether the letting agent is there or not, so it’s theirs to lose, which felt like an inherently comedic premise. They take themselves incredibly seriously, but of the majority of lettings agents I’ve met, the strongest job they’ve done is turning me off the place as opposed to keeping it. I’ve got so many stories that we couldn’t put in because they’re just too out of this world. A lot of the time truth is stranger than fiction. Was there much improvisation in this series or was it all carefully scripted? Both. It was very carefully scripted but we were very lucky to have a cast who can make written dialogue sound like improve and naturalistic. Everyone we cast we found very funny in their own right and it would be a huge waste to not let them move around and try their own stuff. So there’s some stuff that’s ended up in that’s improvised. The tours that I do in the show are probably around 80 per cent improvised because it’s all sight gags. So usually I’d get to the flat about an hour before we’d shoot and walk around making notes. I’d like to say yes, but strangely no because everyone was so invested in their characters. I feel like improv becomes slightly problematic when it becomes too much of an in-joke. But I think it was all so within the world that you wouldn’t really crack up. It’s got a great supporting cast, including your sister Natasia. How did you find working together? We’ve worked together a number of times. This was the dream of all dreams… it was magical. We’re both very busy and we see a lot of each other but intensively working together every day and having fun was so special. There’s a scene where we’re out on a pedalo together and just looking at her and thinking about us at the age of five: it was one of those very special moments. And then inheriting Christos Stergioglou as our surrogate dad was so wonderful. Are you and Tash competitive with each other in your comedy? Definitely not competitive. We’re very, very, very, very supportive of each other. We don’t spend a huge amount of time at home together but when we do go home it’s just about trying to make each other laugh. Does it come from either side of the family? I think my parents are both very funny in their own right. Sometimes intentionally, and sometimes not, which tends to be the case with most families. Mine and Tash’s comedy probably comes more from observing than it does from inheriting. Our wanting to do it probably comes from each other’s validation of each other. If you spend your whole life with someone next to you, being like, ‘what you’re doing is really funny, keep doing that,’ it starts to feel like a real thing. We were constantly finding each other hilarious growing up. We both knew we wanted to go into acting but with comedy we ended up being like, "hopefully other people find this funny as well." Alistair Roberts has large chunks of dialogue to deliver in Japanese. Does he speak Japanese? He’s fluent. I wrote the part for him. The only two people that I had from the get go was Tash and Al. We’ve been writing it for five years and I was a big fan of Al. I’d seen him in his sketch troupe Sheeps, I just wanted to see him on TV. He just does a great job of it and he’s someone who runs with improv very well and he can nail scripts. Even the question, does he really speak Japanese, it adds something to a show. So we gave him the opportunity to speak Japanese. Because he’s such a lacklustre character it’s like giving him something really impressive and brings him up a little. 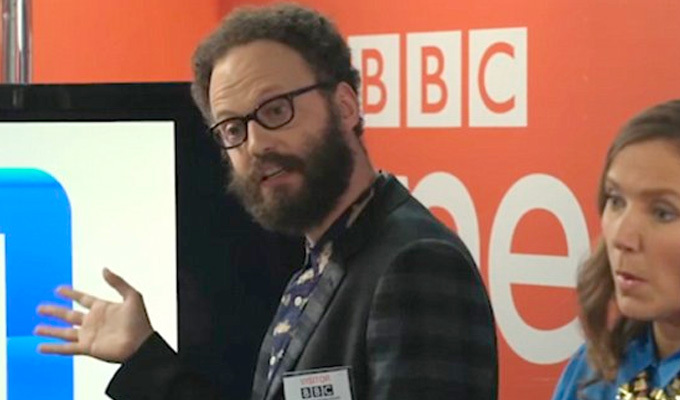 Your co-star Alex Beckett (above in W1A) passed away suddenly aged 35 in April. It must feel like an enormous blow. He was a force of life and genius improviser. An incredibly kind, generous guy who was always a pleasure to have on set. We were very privileged to have him and he was incredibly professional. If we do any more it won’t be the same without him being there. He got on with everyone and everyone involved in the show is completely crushed. In a lot of ways this series is dedicated to him. He did some amazing stuff while he was alive and selfishly I feel very privileged to have squeezed some of the last drops of genius. There was a day when we had my dad on set but we didn’t know what to do with him and Alex volunteered to do some improv with him. Alex reeled off this three minute perfect monologue. Alex was one of those people who genuinely was a brilliant guy. We’ll miss him a lot and send all love to his family. How did you find the experience of writing the series? I’d written on sketch shows and a few pilots. [Writing a full series] was a long, laborious process and you feel like you’re never going to reach the end of it, but it was all necessary. It was like a five-year crash course in how to write a sitcom. I worked with some great people and when we actually got the series commissioned [Friday Night Dinner writer] Robert Popper came on board and I wrote the first three episodes with him. I learnt a lot from him and we had a huge amount of fun together. The writing part is always tough but being able to have breakfast with a hero from mine and relearning and have him occasionally pop out of the room and come back with his head covered in ice cream just to make me laugh, was never in my wildest dreams. The hardest part is the scripting, especially with a show like this where the majority of if it’s funny is the way something’s said as opposed to what is said. You can pray for improv and request that all you want but if you don’t have a good foundation to spring off of, the likelihood is it’s going to become repetitive or it’s going to become self-indulgent. It is difficult, when a show is your baby, to hand it over to other people to direct? Absolutely not. Well it depends on the person in question. We were lucky enough to have the wonderboy Tom Kingsley at the helm who is a very good friend and frequent collaborator of mine. He’s collaborative without needing to be. He could do it all himself but he is so willing to listen and is so interested in what people have to offer, he’s a workaholic and he will do everything. He goes to the nth degree and is the most committed director I’ve ever worked with. Tom is very good with naturalistic delivery and calling me out if he feels like something sounds contrived which is something I’m desperate to her. Critique is good as long as you’re hearing it from a person who you know you’re in sync with. • Stath Lets Flats, which also stars Katy Wix, Dustin Demri-Burns and Tom Stourton, launches on Channel 4 at 10pm on Wednesday June 27.